Carrot Coconut Muffins - A MUST Try Muffin Recipe - THE OLIVE BLOGGER - Recipes your family will love! With the mild weather we have been having here I was in the mood this week to bake up some muffins…but not just any kind! I invited my mom over (we have a weekly Wednesday bake/cook date!) and told her we were going to be making muffins and she suggested carrot…but with a TWIST!! We ended up deciding on Carrot Coconut Muffins, two of my favorite things in one muffin, and got to work on the recipe to make it perfect for you! And let me just tell you…they are AMAZING! They are perfectly moist with a slightly crunchy top, and the coconut compliments the carrot with a gentle sweetness you aren’t expecting. Notice how I topped them off with the shredded coconut before going into the oven? This gave them a lovely toasted coconut top to bite into…YUM! These Muffins are perfectly moist with a slightly crunchy top, and the coconut compliments the carrot with a gentle sweetness you aren't expecting. 1/2 c Margarine you can use butter if you prefer but this works just fine! In stand mixer cream together margarine with sugars until light and fluffy. Add in oil, eggs and vanilla and beat on medium-high until mixed together. In a separate bowl, sift together dry ingredients (flour, baking soda, baking powder, spices, and salt). Slowly add to the wet ingredients and mix until just combined. Stir in the shredded carrot and coconut. Fill muffin cups (all the way if you want a nice fluffy and full muffin!) and cook for 22 minutes (until a toothpick comes out clean). These Muffins are perfectly moist with a slightly crunchy top, and the coconut compliments the carrot with a gentle sweetness you aren’t expecting. Add them to your baking list now! TIPS AND TRICKS FOR THE PERFECT carrot coconut MUFFINs EVERY TIME! Use a julienne peeler to make shredding your carrots super easy! Do not over mix your batter, once you add your dry ingredients you want to mix until just combined…this will keep them fluffy and light! Be sure to sift your dry ingredients before adding them to the wet, this ensures you don’t end up with clumps of baking soda all in one bite. Use a cookie scoop to fill muffin liners and prevent a sticky mess on the pan that will burn in the oven! This also makes sure you have the same amount in each cup, which means even cooking times! If you are looking for nice full top muffins you want to make sure you are filling your muffin cups to the top! This gives them the perfect muffin top! (take a look at the picture above to see how much I filled my muffin cups). You can freeze these (and most muffins) in a tightly sealed container so you can enjoy them later! Well, what are you waiting for?! I bet you have all the ingredients you need to make these Carrot Coconut Muffins RIGHT NOW! These look amazing. I need to try one. I love carrots! Thanks! The coconut really adds a nice treat to the normal carrot muffin! Enjoy! This sounds really good Melissa! Totallly new idea for me to use coconut and carrot together. Thanks Amber!! I wanted to add something fun to my traditional carrot muffin! I think next time I will use coconut oil as well rather than the vegetable..Mmm mmm! These looks so good! I also love that you and your mom get together each week to cook and bake together!! That’s so sweet and fun! They really are a tasty and different muffin!!! As for getting together, it keeps us in touch and sane to have our weekly “dates” who doesn’t love time with their mom!? Pingback: Banana Apple Muffins with Oats - THE OLIVE BLOGGER - Recipes your family will love! the flavor in these muffins sound so delicious. what a unique combo – i love anything that has coconut in it. Me too, coconut just adds so much life to these classic carrot muffins!! Yumm!! Carrot and coconut is such a delicious combination. Never tried them together in a muffin. The toasted coconut on top must have added nice flavor and texture to the muffins. 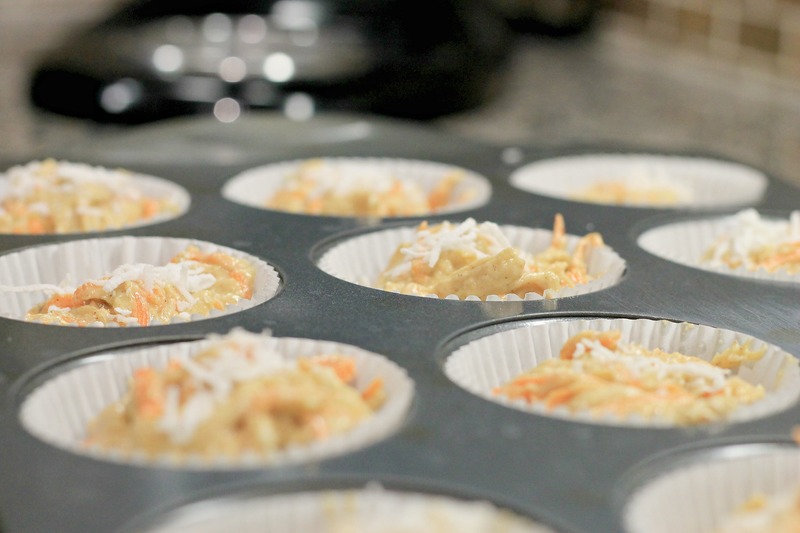 I love how you topped these cute muffins with the shredded coconut before baking! Wonderful idea that must be working miracles with the texture and the taste – can’t wait to try! It really does, there is just something about coconut that makes everything even better! This carrot and coconut muffins looks delicious, great for breakfast. I can every every day. Toasted coconut brings out flavor. Thanks so much, the muffins are great any time of day! Carrot and coconut… oh wow. That’s amazing flavor combo. These muffins look delicious and I bet they taste amazing too. My kiddo loves muffins so I can’t wait to make him these. It’s always nice to sneak some veggies into the treats for kiddos, and the coconut makes them think it’s a real treat too! They are a favorite muffin recipe in our house, the combination of the carrot and coconut is so unexpected and delicious!